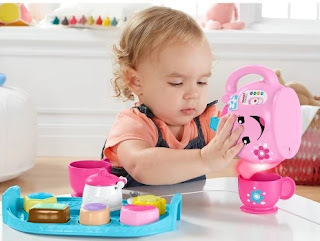 Head over to Target.com for see this adorable Fisher-Price Laugh and Learn Sweet Manners Tea Set for only $15.39. That is less that the price in the store. As a bonus, right now you can get an additional 15% off if you do an in store pickup. Magical teapot spout lights up as toddlers pour out the fun. Press the music tea bag button on the teapot for fun lights, songs & sounds. Open & close the teapot and sugar bowl lids. Plus, use your Target REDcard to get 5% off & free shipping for orders over $35+.